Looking for Cheap Wedding Favor Ideas? Wedding favors are the bride and groom’s way of showing appreciation to their guests for attending and being part of their wedding day celebration. If you are looking for a favor that says thank you, without costing you a small fortune, you have come to the right place. Dollar stores are a great place to begin looking for inexpensive favors. If you don’t see what you want, talk to the store manager who can keep their eye out for that something special you would like to give your guests. Candy, who does not like candy? It can be eaten during the reception or taken home. You can purchase small boxes, wrap them using your color scheme and tie them with pretty ribbons. 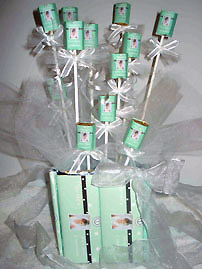 Or, You can have your centerpieces made from candy bars as shown above and then each guest can take one of the candy bars with them as their wedding favor. A cheap fun idea would be to purchase scratch off lottery tickets and have the emcee ask who received the biggest pay off. You can provide a small gift to the winner. Something that will serve as a dual purpose would be to purchase small vases, fill them with flowers and cluster them together in the center of the table. You now have a centerpiece and everyone at the table will have a favor to take home. A pretty idea that will also have a lovely aroma would be to purchase decorative soaps. Tie them up with netting and ribbon, placing one at each table setting. Another netting or tulle idea is to buy herbs and spices wrap them in tulle, tie with ribbons and if you have time, hot glue a small rosette to the ribbon. Looking for a really inexpensive favor? Write a thank you note, poem, or personal message on a piece of scroll paper, roll it and tie with ribbons. It is elegant and costs only pennies. Bookmarks make a practical and useful favor. You can purchase the small metal bookmarks for less than a dollar. If you are creative, you can write your own message, have it laminated and wrap the bookmark in netting and tie with your wedding colors. Whichever you choose, my cheap wedding favor ideas will delight your guests. Need more ideas? Take a gander here.